Knowing the differences in varieties of tomatoes and what they are best suited for, will help simplify the process of choosing which to grow. Before deciding on a variety though, you should determine whether you will be starting from seed, or purchasing starter plants (your choices may be limited depending on what your local garden centers have in stock). Tomatoes generally fall into two different categories: determinate and indeterminate. Tomatoes are determinate if they eventually form a flower cluster and blossom at the end of stem. This causes the plant to stop growing in height. Determinate tomatoes are also referred to as bush varieties. A Tomato plant is considered indeterminate if they only grow lateral flowers and continue to grow indefinitely taller (also called staking tomatoes). Tomatoes may also be referred to by their growing season. A “fast ripening” plant will usually produce fruit within 4 months of being sown. A “main season” plant is expected to produce somewhere between 4 1/2 months to 5 months. “Late variety” plants will not begin to produce until after 5 months from the time they were sown. Open pollinated tomatoes are true tomatoes, meaning the seed has been kept from one plant to the next without being tampered with or intentionally cross pollinated. Heirloom tomatoes are cross-bred varieties that continue to be maintained (usually because the plant is considered especially good). Heirloom types have less disease resistance, but can be grown successfully in all but the very hot, humid areas that are notorious for tomato diseases. A hybrid plant is created by taking pollen from one tomato variety and implanting it into another. This method creates a first generation plant (or F1). If you plan on harvesting and using seeds from your tomatoes for next year’s crop, you should avoid hybrid tomatoes, since the plants that do regrow will produce a weak and unpredictable yield. (Commonly known as “large-fruited”). Beefsteak tomato plants produce big ‘beefy’ slices that can cover a full sandwich. The fruit from a beefsteak plant can easily weigh 2 pounds or more and usually ripens late in the season. The ‘Big Beef’ beefsteak tomato is a preferred choice of many gardeners, or you could try ‘Burpee’s Early Pick,’ which will produce much earlier in the season. Big Beef F1 (staking) – Outstandingly productive, and easily outproduces most other large varieties. Big Rainbow (staking) – Very large yellow beefsteak; as the fruits ripen they go through a phase where they resemble a rainbow of different colors. Brandywine (staking) – Not as tall a some staking plants; this old cultivar (pre-1885, from the Amish community) is renowned for its flavor. Evergreen (staking) – Ripens green, then tones yellow: These solid, dense fruits are well suited to salsas and slicing for frying or sandwiches. Golianth F1 – A large, smooth, deep red skinned commercial variety: Very disease resistant. Giant Belgium – Large, to very large, dark pink fruits. Great White (staking) – A particularly vigorous beefsteak; bearing large, yellowish-white fruits. Grosse Lisse (staking)– Vigorous, and adapted to humid areas. Marvel Striped (staking) – Grown heavily in Mexico. The large, heart-shaped fruits are bright orange with yellow streaks. Mortgage Lifter (staking) – Extremely large, furrowed red beefsteak. Pineapple (staking) – The fruit are yellow-red striped, and the plants have heavy foliage, which helps prevent scalding from the sun. Ponderosa Pink (staking) – Very ripe fruits that are sweet with low acidity. Slightly under-ripe fruits are sweet, with higher acidity. This variety is outstanding for flavor. St. Pierre – A French heirloom variety actively sought out in the street markets for it’s superior flavor. A cherry tomato plant produces “cherry-sized” fruit (approx.). These tomatoes range in size from dwarf, to larger than 7 feet tall. Most cherry tomato plants produce large quantities of fruit, so an average size family is more than supported by one plant. Sungold variety is one of the most highly preferred cherry tomato hybrids. If you are looking for an open pollinated variety, try Black Cherry. Currant red (or Cherry Dots, or Spoon Tomato) (staking) – These are the smallest tomatoes available, though not as remarkably flavored as some others. Black Cherry – One of the only breeds having black skin. Currant Yellow – The yellow form of ‘currant red’. Gardeners Delight (staking) -This vigorous variety produces trusses of 6-12 small, and very sweet fruits. Green Grape – Looks like a cluster of 4 to 12 large yellow/green grapes. Gold Nugget (bush) – Rich colored and small fruits. Peacevine Vigorous (bush) – Said to have a particularly high vitamin C content. Red Pear – Essentially identical to Yellow pear, but with more flavor. Santa F1 Oblong – Great flavor, and usually lasts longer than other varieties after being picked. Sun Cherry F1 (staking) – There are up to 20 small red fruits per truss. This is said to be the sweetest cherry tomato. Sungold (staking) – A golden-yellow cherry tomato with particularly good flavor (heavily preferred over other cherry tomatoes). Great in a variety of climates. Sweet 100 F1 (staking) – The plant is spectacularly productive, and reliable. Small fruits are borne in long trusses of around 15 fruits each. Sweet Million F1 (staking) – Very similar to ‘sun cherry’. Tommy Toe (staking) – A vigorous plant producing small bright red tomatoes that have an excellent sugar/acid balance. Tumbler F1 (bush) – Highly productive plant with orange/red fruits. Has both low sugar and low acid. Yellow Pear (staking) – Old variety, from the early 1900’s. Yellow pear shaped small fruits. (known also as the midget or patio tomato). This variety produces cherry type tomatoes (1″ diameter or less). These plants have a very short life cycle, quickly producing crops for a short period of time. Due to their compact vines and tight root structure, dwarf tomato plants can be grown in a hanging basket or small containers. Red Robin is a great choice for flavor, or you could try Small Fry if you are planning to grow in a hanging basket. Tiny Tim and Cherry Gold – Tiny Tim plants will grow to about 16 inches in height and produce small 1″ fruits. Cherry Gold is the yellow variety of Tiny Tim. Red Robin – Red Robin plants are truly dwarf, only growing to about 12″ in height. They are very prolific and easy to grow, with a mild flavor. Yellow Canary – Yellow Canary is the gold version of Red Robin. Patio F Hybrid – Patio F plants will grow to about 2 feet and produce larger fruits. This plant may require some support since the fruits grow heavier. Small Fry – This plant is excellent for hanging baskets and continues to fruit throughout the season. Micro varieties – Any micro varieties are incredibly small (approx. 8 inches tall). 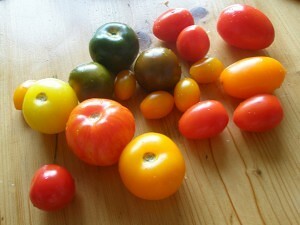 The first micro variety of dwarf tomatoes was the Micro-Tom. Napoli (bush) – Napoli produces small, bright red, pear shaped solid fruit, and has relatively good disease resistance. Opalka (staking) – An heirloom variety which produces elongated red fruit on a short vine. Unlike most paste tomatoes it is great for eating plain too! Principe Borghese (bush) -Small oval red fruit that often contains no seeds at all. Very productive and suitable for bottling or drying. San Marzano (staking) – A standard mainstream paste tomato. Deep red, small oval/pear shaped, dry fruit borne in clusters on the vine. Plum tomatoes usually have a fine thick flesh and less pulp than other varieties. This makes them great for holding shape when canned, and for slicing. They can also be easily cooked into a sauce. Red plum is the most popular plum variety. Amish Paste (staking) – A variety maintained for many years by the Amish. Costoluto Genovese (staking) – Uneven medium sized tomatoes that are vigorous and work well for sauce (not great for canning or slicing). Red Plum (staking) – Large harvests of small plum shaped fruit, perfect for salads, or canning. The seed locule (or pulp) tends to fall out if these if they are sliced. Salad Tomatoes’ abundant seed pulp makes them a poor choice for sauces, but, their small size makes them ideal for cutting in half or in quarters to have with a salad. Try Burpees Longkeeper for a tomato that lasts late into the season and stores for a long time, or Cherokee Purple, for an incredibly sweet taste! Arkansas Traveler – Pink fruited heirloom variety that is widely adapted and has good flavor. Burpees Longkeeper (staking) – A medium to large orange/red tomato. Main season, but intended to be delay-planted to ripen late. Cherokee Purple – A short staking variety said to have been grown by the Cherokee tribe. Dirty pink/purple colored fruit with brownish shoulders. Very Sweet! Djena Lee’s Golden Girl – Deep yellow tomatoes with a reputation for excellent sugar/acid balances and intensity of flavor. Dr.Walter (staking) – Productive. Low acidity. Early Girl (staking) – Starts maturing early and carries on producing to relatively late in the season. Fourth of July (staking) – It has particularly good flavor for an early season tomato. A good choice for cool season and short season areas. Gold Dust– An orange skinned version of ‘Taxi’. Green Zebra – Uniform, small olive-yellow fruit overlaid with dark green stripes. Guernsey Island (staking) – Medium to small fruit, red streaked with dull bronze/green color. Heatmaster (syn. ‘Sunwave’) – adapted to hot subtropical conditions. This deep red, mid season tomato has great disease resistance and is medium sized. India F1 – A round red, medium to small tomato that is very prolific. Jimma F1 (staking) – A medium sized tomato bred to last for up to a month without rotting once picked. Moneymaker (staking) – A vigorous plant, better adapted to humid conditions than most types. Nebraska Wedding (staking) – Medium sized orange skin and flesh. Late ripening. Potentate (staking) – Attractive crimson red, firm tomatoes, with moderate acidity and low sugar. Stupice (semi determinate) – A small to medium red salad tomato that has high acid and medium sugar when just ripe, but has mediocre flavor when very ripe. They tend to be hard to pick. Taxi (determinate) – Lemon yellow turning deep yellow with maturity. Holds together well when sliced, with a slightly savory, medium-acid and low sugar taste. Tigrella (or Mr. Stripey) (staking) – A small fruit with red and orange stripes. It is quite productive, with tough skin and loose gel-like pulp. Yellow Perfection (staking) – An old English variety with thin golden/yellow skin. Has good flavor and is very juicy. Consider your climate (humid climates may require hardier types), preferred growing season, preferred use (for slicing, canning, sauces, etc.) and requirements for hardiness, before choosing a variety. You should also know in advance if you will be planting in a garden or a pot, (as there are only a few varieties that will do well in pots).